Do we listen a lot about what is Steampunk specifically? Where did it come from? In this piece of writing, we will be answering these questions in detail. It can be defined in several ways nowadays. If we talk about entertainment and media, it is looked upon as a sub-genre of science fiction. This makes use of the technology and aesthetic designs that are inspired by the 19th century. The Steampunk usually takes place in an alternative historical world where most significant is the steam-powered technology. It would not be wrong to say that the same is the defining aspects of most of the Steampunk activities, for instance, the steam-powered cars, analogue computers, and airships. The technology along with the aesthetics that are shown have nearly the advanced technology however with a retro feeling and looks. Also, Steampunk refers to a certain artistic style and attire fashion that has been developed over the time. The credit goes to the several Steampunk works out in the place. This kind of fashion and style has specific Victorian feel that is inspired by the designs of late 19th and early 20th century. Thanks to the prominent display of design and technology that is steam powered having a touch of retro-futurism. Normally it is thought that Steampunk enjoys its origin from literary fiction. It was back in the year 1987 when the term The Steampunk enjoyed its first appearance. The term was used in a sarcastic manner as one of the derivatives of another term i.e. cyberpunk. But today, Steampunk is used to define literary works that have been created back in the 1950’s. As these kinds of fictional works have been around for decades; the matter of time was what it took to become popular and be prominent in the fashion world. With the passage of time, exponential popularity and growth have been seen in this regards. At the beginning of 2000, we have seen a number of Steampunk fashion stores being opened and this particular style is becoming common more and more around the globe. We see even media following this sense of style. It is the reproduction of real world clothing fashion. It can easily be found in the steampunk literature. It is that simple enough. If and whenever you find yourself in doubt, all you need to do is to wear something Victorian and then add to it. These were the Victorians to be the first ones to capitalize on the technology of steam where it affected the day to day life. Hence it is of no surprise that most of the steampunk writers belong to the Victorian world. If they do not belong to it, they are seen to be highly impressed by the Victorian era. If you feel that your attire is too much Victorian, then trust me; you are doing the right thing in every possible manner. 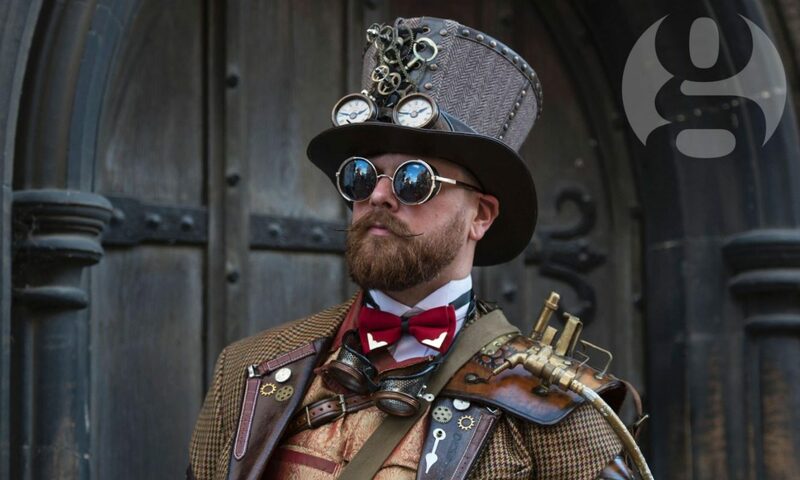 Three qualities of the Steampunk fashion includes that the outfit must delight the senses engage the viewers and entertain the person wearing it. You need not be obliged to take away from the appeal of an outfit or style that it is not enough steampunk. Also, you should not be coerced, misled, or second-guessed into including a collection of steampunk fashion symbols. You should not be thinking if they fit with your overall attire, or with the vision that you are trying to produce. It is to bring to your kind knowledge that goggles are one of the most infamous among these symbols. Some people claim that steampunk is white, or black, or brown or only light colours or only dark ones. But the fact is that all of them are wrong. Virtually all or any colour can be steampunk. If you are willing to wear black colour, there is comprehensive steampunk justification in it for you. If you feel like wearing brown, then again there is steampunk justification there. Similarly, if you want to wear bright colours, then again you have the justification. You need to keep in mind that, steampunk is set in a world that is composed of comparatively advanced technology. Hence it is pretty much reason to have the complicated machine made patterns having vibrant colours. You have the liberty to like the other genres too. If you love a fashion style that does not fit the steampunk such as pulp adventure, enlightenment era, medieval etc then you should be proud of it. There is no need to feel being compelled to trying wedging it under the caption of steampunk. There are all genres easily accessible that people have worked out their best to expand, create, and explore. So, we actually owe it to them to respect this diversity and creativity of their differences. We all are well rounded and diversified people with different interests. We have every reason to be proud of it. Have fun and enjoy being yourself. That is all what this is all about. There is no need to feel compelled to conform to the others around. Do not feel shy about expressing only because you are not dressing like all others. There is no need to ask “do you feel this is steampunk”? You must say “I feel this is steampunk” and this is why it feels so. At worst, you will find people disagreeing with you and you can always discuss with him or her. What is next there for Steampunk? In single sentence and very simple words, this specific world, niche, genre, fashion or style etc whatever you call it, is going to continue to grow and nothing else.